Skin tone: South Indians are known for their flawlessly clear skin that forms the perfect canvas for any makeup artist. Whether you have a fairer skin tone or a dusky shade to your skin, flaunting it is certainly not a bad idea. Our professionals ensure that the right shade is used to highlight your features that blends not only with your natural look but also your bridal attire for the day. Expressive eyes: Bright eyes highlighted with kohl and heavy makeup is a must for south Indian brides. 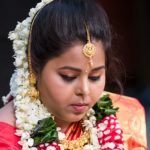 With the joy shining in your eyes the day of your wedding will only make your eyes that much prettier with the right kind of south Indian wedding makeup used to focus on the windows to your soul. 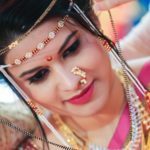 Satish Kargutkar and his team specialise in doing their best to augment the natural beauty of the bride with the help of makeup without trying to change your features. Facial contours: Another best feature of most south Indian are their facial contours that are naturally chiselled to perfection. Makeup can be used to highlight this particular feature of the bride, enhancing the bride’s beauty further to a great extent. Our team can be relied upon to use their skills and expertise by highlighting your facial contours in a way that is appealing and adding to your beauty. To all the gorgeous south Indian brides out there, we hope to work with you soon!